Standards are plants that have a clear stem usually 30-60cm high (12-24"), though sometimes taller, with a round or mop-head of a plant on top. They are sometimes made by grafting the normally bushy plant you want onto a different rootstock that also provides the tall erect stem. 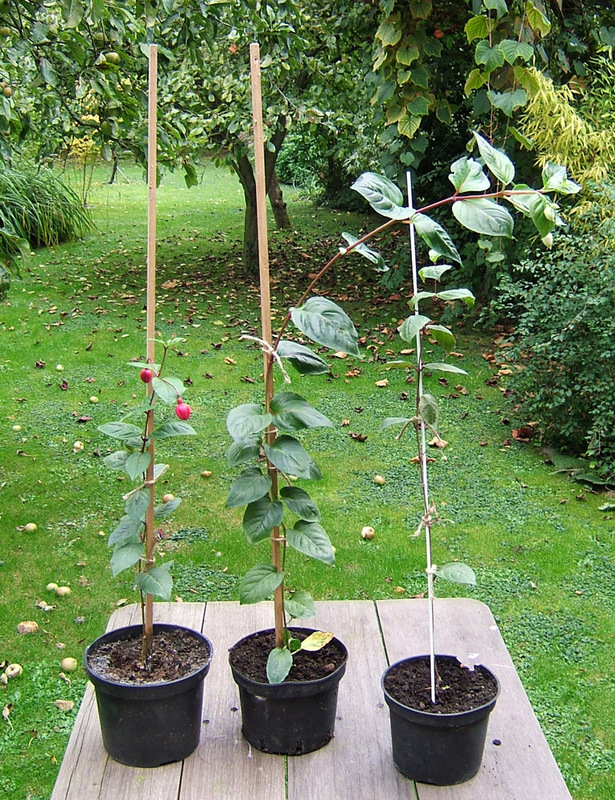 Half hardy Fuchsias however don't need to be grafted, they are relatively easily trained by pinch-pruning in just over a year from initial cutting or plug to a fully-formed standard. You will need somewhere to over-winter the plant, a cool frost-free greenhouse is ideal, warm temperatures are not so good as there won't be the light to go with it and so the plant will grow weak and leggy. A cool windowsill indoors will do at a pinch. 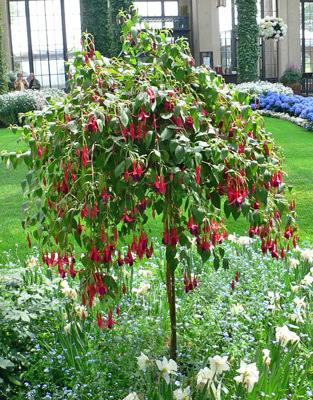 Many varieties can be used to make a standard Fuchsia, the main criteria is that they are a strong grower, weaker growers will take longer or may not reach the required height. The technique is one of training the plant to initially grow vertically up a stick without developing side-shoots and then once it has reached the desired height, allowing it to become bushy at the top of the stick. As long as you don't neglect the plants you are training, it is a straightforward and successful gardening trick to try and gives a very pleasing result. 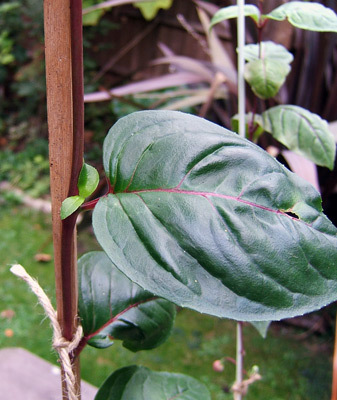 Do NOT remove any leaves, the large leaves that grow on the upright stem are vital at this time as they provide the energy for the plant to grow, without them it will struggle and eventually die, they will be removed much later on. 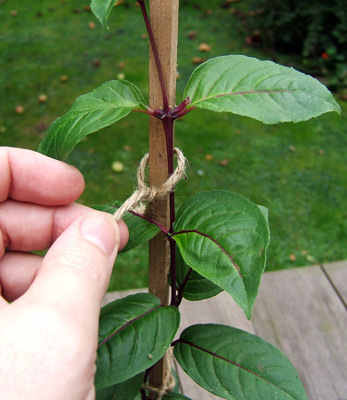 Tie the plant loosely to the stick, the stem will thicken up in time so give it a bit of space to do so, be gentle,the stem will be quite soft at this stage and easily damaged.. Allow it to grow. but make sure you check regularly so that you can tie it to the stem regularly and don't let it bend over like I've let the middle one here do. You want to encourage your plant to grow tall and straight with no sideshoots or flowers. Tie the stem to the stick every 10cm (4") or so and pinch out flower buds as they form and also side-shoots as they form. 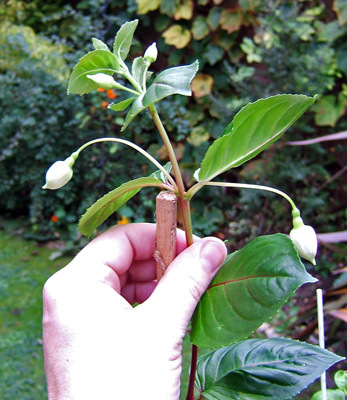 If removing flower buds that are forming at the top of the plant, be very careful not to remove the growing tip. I find it much better to remove flower buds and side shoots with a thunmbnail and finger tip, it's all too easy to accidentally and possibly disastrously nick the wrong bit with scissors/secateurs. Do NOT remove any leaves yet. Flowers if left on will take energy from the growing plant, slowing it down and possibly resulting in a much shorter plant in the end, you need to be quite ruthless. 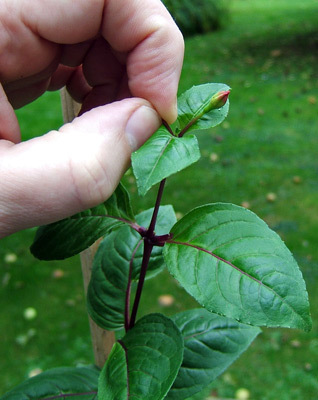 Allow the plant to continue to grow tying in to the stick removing side-shoots and flower buds as they form. It may reach the top of the stick by the time winter arrives depending on when you start your standard off, though this may not happen until the following spring. When the plant is about 30cm / 1 foot high, it should be planted into a 2 or 3L pot with its stick attached. You could alternatively start in this larger pot to avoid repotting. Eventually the plant will reach the top of the stick, when it is 3 pairs of leaves clear of it pinch out the top growing tip and stop pinching out side-shoots that form at the top 2 pairs of leaves. When each side shoot has formed 2 pairs of leaves itself, pinch that out to make a bushy head, when you are satisfied with the size, stop pinching any shoots at all and allow it to flower. You can continue to use pinch-pruning to control the shape if needs be. Continue to remove sideshoots and flowers from the stem, but not the the leaves until there is a good bushy head of growth to provide energy for the plant. Once a good head of leafy growth has formed, the main stem can be cleared of the leaves. Stop pinching out the tips at the top of the plant about 6-8 weeks before you want it to flower. The main stem will need to be kept clear of leaves and side-shoots which may continue to form. Leave them a little longer than this one however so you make sure you remove it and avoid any potential further damage. It will probably try quite hard to make side shoots and flowers up what you want to be a bare stem. When the plant is pruned, "complete" and flowering vigourously it will become quite top-heavy, take care where you position it outdoors, preferably not in an exposed position, a heavy clay or ceramic pot will aid stability. Q. Just how do you spell this name!? A. This genus of plants is named after the botanist Leonhart Fuchs, so adding "ia" for Fuchsia makes it more Latin-like. Other similar examples are Joseph Banks and Banksia and Louis Antoine de Bougainville and Bougainvillea. Photo credit: Top of page, standard Fuchsia - Raul654 published under CC3 Attribution Share and Share Alike Unported license.